The Sweetest Spark, book 3 in my Spark Bothers series just published earlier this month. As with any book release, I was both excited and anxious on release day, especially when the reviews started coming in. In my four plus years of being an author, I’ve come to learn that not everyone will like your story—and that’s totally okay!—but some definitely will. And among those who do, they may not love every single thing about it, which is okay, too. So, I approach reviews with one eye closed (sometimes literally, haha) and an open mind. I appreciate each and every person who takes the time to leave a review and take what they say to heart. Therefore, if there’s an element of the story that several reviewers all mention, I’ll take a closer look at it. For this particular book, a couple of reviews said the Christian message felt a little forced and strong. I’ll admit I was surprised to see this because I didn’t intend or try to be preachy. After some thought, however, I realized that I had included a few more Scriptural references in this book than in books 1 and 2 of the series. Hmm, I suppose I did preach a mini sermon in this story! Lol. But I really do love that passage and thought it fit well in their conversation. I also understand though that there are different ways to write Biblical messages into a Christian romance. So this begs the question: When does a Christian Contemporary Romance become too preachy? How many Scripture references is too much? When does the Christian message start feeling forced? 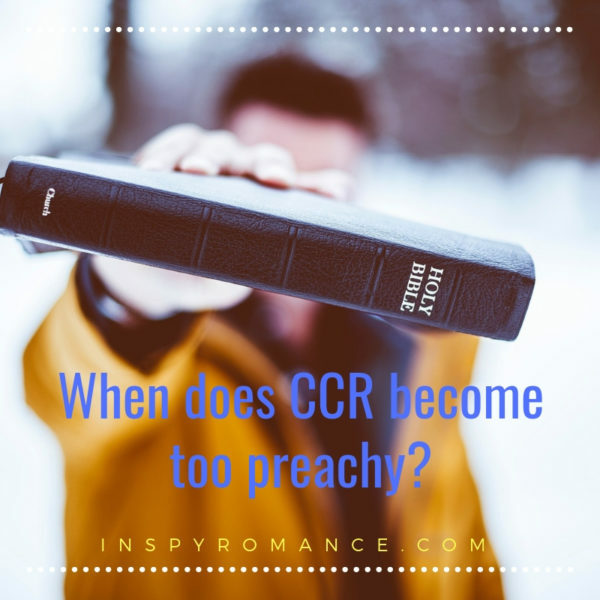 I would truly appreciate hearing your answers because I’d love to understand CCR readers better. Please comment below and let me know! *Please note, today is the last day The Sweetest Spark is on sale for 99¢. Get your Kindle copy HERE. Also available in Kindle Unlimited. PS, hearing on our Australian news about seriously cold weather in the US- keep safe everyone and stay warm, it sounds intense! Hi Wemble! Haha, yes, that was my plan with this post. ;) No, but really, I so appreciate all the input I’m receiving here; it’s like having my own author-reader sounding board. I do agree with you—this topic is quite subjective, but it’s definitely something I want to keep in mind as I write CCR. Thanks for chiming in! I agree with Wembles response. I think it depends on the person what will feel too preachy but like also said, if every convo has scripture passages that would be too much. Hi Sabrina! Yes, I definitely agree with that too; there should be a good balance to story-telling. :) Thanks so much for reading and commenting! Hi Liwen, This is a question I’ve been pondering from a slightly different perspective. When I pick up a CCR, I’m looking for at least one character, if not both the hero and heroine, to have a spiritual story arc. The story may or may not include Bible verses, but the characters will have a faith journey in the story. I’m more likely to be dissatisfied by a Christian-lite CCR than bothered by a little bit of preachiness (not that I think your excerpt is preachy, lol). :) For some readers, one mention of a Bible verse may be their definition of preachy. Others may consider that same story to be spiritually lacking and want more Christian content. Hi Narelle! Your question is definitely a valid one, and it points to how wide of a spectrum CCR has become. Wouldn’t it be nice if there was a scale for a story’s spirituality (like there is for the spiciness/sweetness of romance)? Thanks for chiming in! Good morning! I am going to jump on that sale and get this today, thank you! As for too preachy? Well, I think a lot of that depends on the individual reader…and where they are in their own life’s journey. Personally, I want to read stories that refer to Bible verses and get me going to my Bible to read them as well….what I don’t appreciate is a book being promoted as CF and it has NO Bible in it…just ends up being a clean story, which is nice, don’t get me wrong…but I do want to ‘hear’ from God when I am reading my fiction too! You’re right; a clean story is just not the same as CF. I would expect a lot more “meat” from CF, too. Thanks so much for your input! I read this book and I didn’t feel it was too preachy. Having a few bible verses is encouraging. You never know who might need to read that verse. Keep up the good work. Hi Gina! That’s exactly the reason why I included those verses! You never know how God may use fiction to “speak” to someone. Thanks for your input and for your encouragement! I honestly don’t think the problem is with the story so much as a challenge we’ve created by allowing “inspirational”, “sweet” and “clean” to all be considered basically the same thing genre-wise. From there, CCR tiptoes over as well and someone who wants only sweet reads a CCR that’s more deliberately Christian (clear and overt spiritual arc beyond “going to church and praying”) and some will dislike that because it’s not what they thought they were getting. Hi Elizabeth! Yes, I couldn’t agree more! I’ve seen many non-CCR books manage to slip into Amazon’s CCR or inspirational categories. It’s so hard to gauge where a story is at spiritually unless you read it. I’m so happy you loved Colin’s character. :) Thanks so much for your input! The problem lies in the fact that the “inspirational” category on bookseller sites isn’t truly for Christian content. It’s for stories that are inspirational in nature, regardless of religious content or lack thereof. If you peruse that category on Amazon, for example, you’ll find stories written from Christian, Wiccan, pagan, humanistic, atheistic, Buddhist, and a host of other worldviews. “Inspirational” means stories that inspire. It has nothing to do with the worldview of the content. “Clean” and/or “sweet” have the same issue. A story can be both or either and completely non-Christian. That’s one of the reasons I avoid marketing my books as “inspirational” and only use “Christian”. It’s even noted in my book descriptions. I still get the occasional “I didn’t know this was a Christian book” review, but I can’t do much about readers not apparently reading the whole description. I did switch to noting it at the beginning of the description instead of the bottom, though, and that seems to help. As a reader, the above is also why I avoid “inspirational” books and look specifically for those labelled “Christian”. I still run across clearly non-Christian books in that search occasionally, but it’s far less likely than looking for “inspirational”. Hi Dawn! Yikes, it does sound like inspirational has taken on a very broad meaning. I definitely agree that sticking with the “Christian” label is a lot safer, both as a reader and author. Thanks for your input! There is something to be said though, for making sure the character referencing scripture does it in a way that reads as natural and realistic. It’s super important for CCR to be theologically sound and faithful so scripture ought to be in there, it just needs to be true to life and then I think it passes the ‘preachy’ test. Hi Christa! So sorry to hear about that two star review. Thank you for pointing out how important it is for CCR to be theologically sound. It’s a great responsibility (and privilege) we have as CCR authors to share God’s truth with readers. I appreciate you reading and chiming in! For me, it becomes preachy when it’s telling, not showing. Extreme example: if the narrator pulls the reader aside to explain something to them instead of the spiritual content being woven naturally into the dialogue and thoughts. And, yes, reader expectation for what they bought is the flip-side of the coin! Hi Valerie! Ahh, the age-old struggle for authors—showing vs. telling. Good point! Thanks so much for chiming in! “Preachy” is definitely a very subjective concept, in my experience. It means different things to different readers. I fall in the same camp as Valerie above. The excerpt you used in the post isn’t preachy, though I’m sure some readers probably wouldn’t agree with me. Some readers seem to see pretty much any use of Scripture as a writer being “preachy”. When I see such reviews on books I’ve read, I find myself wondering what kind of conversations they have with other believers around them. Don’t they ever include God’s Word in their responses? I’m reminded of a pair of reviews I saw on an author friend’s book I had read. A redemption story with a very well-written, natural spiritual arc. One reviewer claimed the book was “preachy” and felt God was constantly shoved in her face throughout. Another reviewer on the exact same book said she couldn’t find God anywhere in the book and felt it had been misclassified in calling it Christian”. I found myself wondering if both had even read the same book I did. Then, I’m also reminded of a brief conversation I had with someone several years ago. She asked me how I make decisions about the things we were discussing that day. I told her, ” i use the Bible as my guide.” Can’t get more simple than that response, right? She immediately got huffy and accused me of “preaching” at her. Okaaayyyy…. Given those two experiences, I no longer worry about this aspect of writing. I write what I feel led to write. With the help of my editor, I make sure everything in my story is needed for the character and story development and flows naturally, then I leave the rest in God’s capable hands. Readers will like it, love it, or hate it, depending on their own biases, life experiences, likes/dislikes, temperaments, etc. Hi Dawn! That example of those two polar opposite reviews is so interesting! It just goes to show we can’t predict how a story will be received. But yes, like you say, God will use our work however He chooses and it’s out of our hands after we hit ‘publish’. Thanks so much for chiming in and sharing your experiences! I think Narelle and Elizabeth make good points. As a Christian, that’s the kind of book I enjoy and read for encouragement. I’m more likely to be disappointed by too much worldly content. Most of the negative reviews I read about references to God usually state they did not know it was a Christian book and/or were not looking for that type of book. It must be hard reading the reviews because some of them are quite harsh. It’s sad they don’t give them a chance. Hi Linda! Yes, my skin has definitely grown thicker over the years when it comes to reading reviews. It’s a “let go and let God” thing of praying and hoping that those who need the story will read it and as you say, get the encouragement they need. Thanks so much for reading and chiming in! Hi Gwen! I love how you put it—stories that mirror real life. That’s certainly my intent with the CCR I write, to show the real-life struggles that Christians face and the hope and redemption God brings. Those to me are the best kind of stories to read. :) Thanks so much for chiming in! I am not familiar with your writing, but if it is marketed as Christian fiction i wouldn’t find the above passage at all unusual. Like others have mentioned I have seen a lot more of the sweet/clean/wholesome books marketed lately and I guess if someone was looking for that the scripture references could be an issue??? Not quite sure! Hi Patty! Yes, I agree that it’s important to have the book marketed correctly so readers know exactly what they’re getting. I do write both CCR and sweet/clean books (and label them as such), but maybe it wasn’t quite what readers expected. Thanks for your input! Keep up the good work and write as the Lord leads you. I agree with Valerie Comer on showing rather than telling. Great post, Liwen. And great question. I don’t think your passage is too preachy at all. The only book I ever read that I thought was too preachy was years ago. Around 1999, when Christian books hadn’t been around too terribly long. I read a book where the heroine thought in Bible verses and constantly did thought prayers. I mean every page had a dozen prayers and/or Bible verses. It got on my nerves and I was a strong Christian at the time. The reason it got on my nerves was partly because it was too much thinking and not enough doing. But also real people don’t constantly have thought prayers or Bible verse thoughts. I think as long as the scripture or prayers are sprinkled in lightly and don’t stop the flow of the story, they’re fine. I’ve also come to realize that a lot of the time when a reviewer doesn’t like the spiritual message, it either convicts them, or they’re not believers. My two cents worth. Hi Shannon! Oh my, I think that particular book you mentioned would’ve got on my nerves, too. I like how you put it, that it was too much thinking and not enough doing. I like characters to put into action what they’ve learned. Thanks so much for your input! My personal opinion is that if the book is labeled as “Christian”, the people planning to read it should expect there to be Scripture references in the book. I feel like a Christian book is expected to have Scripture references in it as well as the “read between the lines” faith walk of someone in the book. Again, in my opinion, if people are picking up a “Christian” book and find it too “preachy”, they may need to check their heart. Besides telling an entertaining story, a Christian book should be shining God’s light in the world and be a way to draw lost souls to Him. I don’t expect it to be a 200 page sermon, but it should be reflecting God. Hi Lisa! You have some great thoughts. :) Yay for an entertaining story that shines God’s light, but nay for a 200 page sermon. Thanks so much for chiming in! I think it depends on the person who is reading it. I don’t mind scripture in the story and at times am grateful for it as it helps me. I thought your excerpt flowed well. I prefer some Bible verses to none but have read a few books where I think they really wanted to write a Bible study, which is fine as long as its labeled as such. I much prefer CCR to clean, but also read clean, wholesome. I truly appreciate Christian authors and all the work that goes into giving me good books to read. Hi Diana! I’m glad to hear you read both CCR and clean and wholesome since I write both. Thanks so much for your feedback! I like it when you include scripture. If someone thinks it is too preachy, I think that it tells them something they should be thinking about. We all should think of scripture and apply it to our lives daily in all activities. Your books remind me of that.